LALive, the new entertainment complex across from the Staples Center, has within it the potential to become a vital public place worthy of a Great City, if only they would add plumbing along with a commitment to serving the public who arrive on foot, on bicycles and via mass transit. This past Tuesday, Councilwoman Jan Perry hosted "LA's Biggest Inaugural Viewing Party" at LALive's Nokia Plaza, an event that drew an estimated 1,500 people, some of whom arrived in the wee hours of the morning in order to stake out the prime spots. 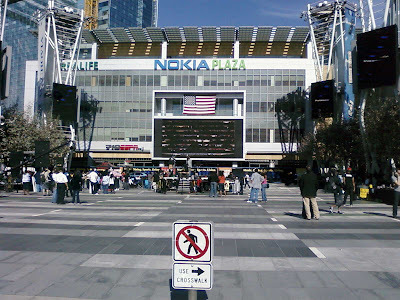 In spite of the fact that LALive is designed to handle crowds of up to 30,000 people, this simple Inaugural Party crowd of 1,500 required the placement of porta-potties on Chick Hearn Court, all because there are no public facilities at LA's most acclaimed of public facilities. LALive's Managing Director, Lisa Herzlich, contradicts the claim that there are no bathrooms by pointing out that there are restrooms in the West Garage, located a block west of LALive, on the other side of the Nokia Theatre. "It actually makes sense, if you think about it, because after driving for 45 minutes to get here, our patrons appreciate having a convenient restroom." This is a good point and in all fairness it appears that LALive does actually have restrooms, although the need for porta-potties for a simple crowd of 5% capacity demonstrates that the restrooms are of questionable location and efficacy. Herzlich's response brings up a larger issue: LALive's demonstrated bias to those who arrive in private vehicles over the transportation solutions who arrive on foot, by bike and via mass transit. Perry's invitation to the Inaugural Party reinforces this bias by including the lure of "Complimentary Parking at Olympic West Garage," an odd perk that was publicized in the Downtown News, a publication that caters to a downtown audience who would surely be sensitive to the impending "pedestrian-oriented" direction that this neighborhood is headed. LALive's tenants, in the same issue of the Downtown News, demonstrate the same tired mobility paradigm with their LALive "Lunch just got a lot more interesting..." ad that features "Parking Validation with purchase" as the big draw. An inspired invitation to LALive's Inaugural Party would have included mass transit directions, bike parking directions, a call to take to the streets and walk this great city. Inspired advertisements would have offered discounts to those who have a Metro ticket, to those who ride a bike, to those who are part of the streetlife revolution! But instead, the LADOT and the LALive staff were busy directing vehicular traffic to their VIP facilities in the West Garage while the Conga Room staff claimed that they didn't have restrooms, the ESPN staff informed the public that the restrooms were for customers only, the very polite LALive staff directed cyclists down the escalators into the bowels of the parking facility in order to lock up their bikes, and the public enjoyed toilets worthy of a construction site. Something's wrong with this picture! LALive is a work in progress, apparently operating under a Temporary Certificate of Occupancy. To that end, James Laite, Senior Director of Engineering, acknowledges that there are still discussions taking place with regards to amenities including restrooms and bike racks and way-finding that would enable visitors to actually find the facilities without having to use a GPS. "LALive was designed by one group while another group manages it, which creates an interesting challenge for us as we encounter situations such as the lack of restrooms and the bike parking facilities." Cyclists have complained that the bike parking, specified in the City's Municipal Code as being at a minimum of 2% of automobile parking capacity, is inaccessible in its current location in the underground parking facility and that it falls short of the legal minimum. Cyclists also point out that half of the bike racks are those referred to as "Marquis de Sade" racks and are cumbersome to the point of absurdity, sitting empty in confirmation of their uselessness. Meanwhile, proponents of streetside bike parking point out that the impact of bike racks on the sidewalk is both psychological and practical. The presence of visible bike racks confirms that cyclists are welcome, provides an intuitive opportunity to park and keeps the bikes safe and in the public eye. The need for intuitive bike parking locations was demonstrated this past Tuesday as bikes were locked to the trees and poles that ring the LALive facility, all while the underground racks sat empty. John Fisher, Assistant General Manager of the City's Department of transportation, points out that the City Council has given LALive a unique permit which will allow for the closure of Chick Hearn Court on a regular basis, creating a pedestrian street. "We're working with LALive to implement an automated bollard system that would allow them to close the street between the Staples Center and the LALive complex without having to deploy significant manpower." This "regular" street closure is projected to start at 7pm on Friday evening and continue through the weekend until 4am on Monday morning. LADOT Bikeways "Under New Management"